Headstone over the grave commemorates Constable Daniel O`Boyle who died on duty in 1863. The headstone was erected at the gravesite in 2001. 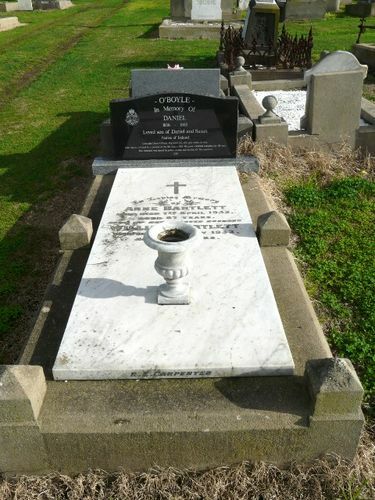 Constable O’Boyle, who was born in Derry, Northern Ireland, was buried in an unmarked grave at the Warrnambool Cemetery. His colleagues paid for his grave but their combined contributions were not enough to cover the cost of the burial and a headstone. The grave remained without a headstone until November, 2001, 138 years after his death. As a result people by the name of Bartlett were buried on top of his grave. On 4 August 1863, at about 7:00 am, whilst supervising prisoner James Murphy, Constable O'Boyle began cleaning the Warnambool Court House. As he was kneeling down to light a fire, Murphy struck O'Boyle on the head with a heavy hammer. The resulting injuries were extensive, and O`Boyle died at 4:50 am the following day. Immediately after his attack on the Constable, Murphy calmly walked from the Court House and disappeared. An extensive search was commenced within minutes of the attack, but Murphy remained at large for two days before being recaptured some 40 kilometres away and charged with the murder of Constable O'Boyle. He was subsequently convicted and was hanged at the Geelong Gaol on 6 November 1863. Constable Daniel O`Boyle, Registered No. 1678, died whilst on duty, from injuries inflicted by a prisoner on the 5th August, 1863. His grave remained unmarked for 138 years. This memorial was erected by police, citizens and the City of Warrnambool.